You might call them Cyborg Insect Spies. The US Defense Department's Advanced Research Projects Agency DARPA has a novel, science fiction like robotic research program underway. It's called the HI-MEMS program. Scientists have explored using a variety of insects as part of the program. They have put implants on flying moths and beetles. Using the implants, researchers are able to stimulate insect brains and actually control them in flight. 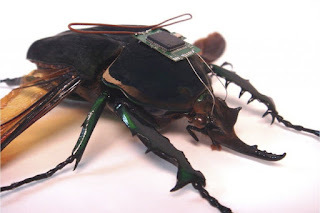 The potential use of these robotic insects is fascinating. The goal is to deploy them on missions in the field to gain access to areas not reachable by traditional robots and humans. This is an important scientific research program that DARPA is actively pursuing.